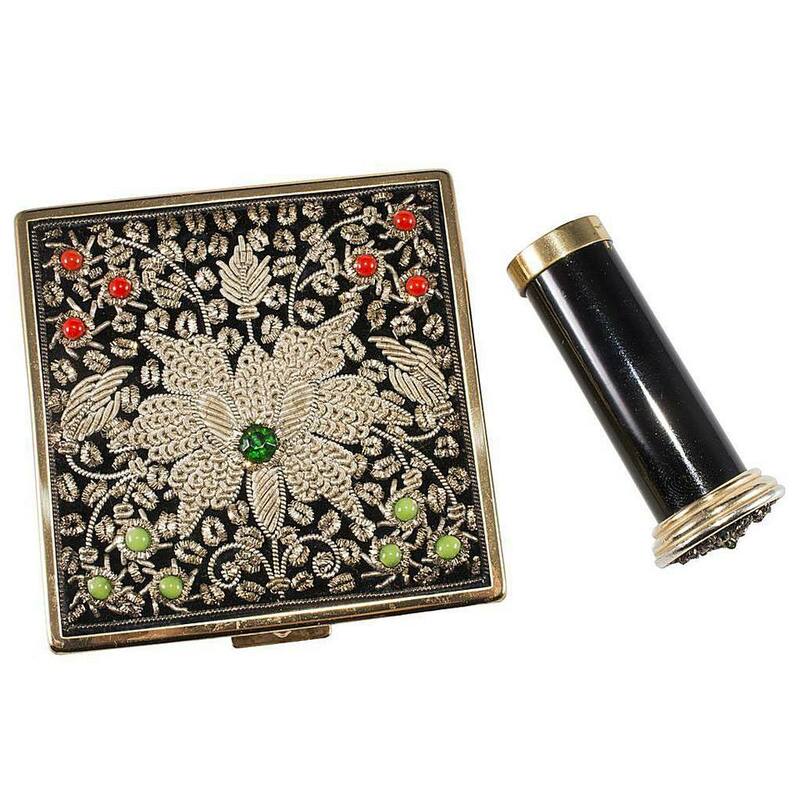 Ciner Embroidered Compact with Matching Lipstick. Powdering a nose 50 to 75 years ago wasn't merely practical, it was an event. Long before pressed powder was available in drugstores and department stores, ladies carried fancy loose powder compacts in their handbags. Most ladies had an array of compacts to choose from since they were often presented to them as gifts by husbands, suitors, and friends. Although many of these little accessories were rather plain and practical, designed to hold loose powder in a way that's transportable, many were far from ordinary. Collectors discover everything from art deco styled compacts from the 1920s and 1930s to rhinestone-studded examples from the 1950s and everything in between when compact shopping. Some of the rarest and most valuable compacts offer crossover appeal to collectors. Hatpins dating back to the Victorian era with compacts built into the head and super long stems make a wonderful find for an ardent collector. These came complete with tiny ostrich feather puffs when they were new, and when those are still present it's an added bonus. Compacts with similar puffs were also concealed in bracelets, rings, and other adornments back in the day, and those appeal to vintage jewelry collectors in addition to compact enthusiasts. Both vintage toy and compact collectors covet the hard-to-find Schuco jointed teddy bears and stuffed monkeys hiding powder containers within the bodies. Those were more likely to be seated on a vanity than carried in a handbag, but they're just as desirable as the purse variety. Vintage evening bags dating from the 1920s through the ‘50s with built-in compacts by companies like Whiting & Davis are also coveted by compact and handbag collectors alike. Figural compacts are considered to be hard to find, and their prices reflect this rarity. These examples, shaped to resemble everything from chairs to pianos to gloved hands, surface from time to time in the secondary marketplace but the steep prices and heavy competition keep many collectors from owning them. In the more affordable range, some collectors prefer to focus on extreme compacts known as "flapjacks." These collectibles get their name by actually resembling a pancake in shape by measuring six inches or so in diameter. If a large mirror is in order, the flapjack surely fills the need with glare to spare. At one time compacts were also favored souvenirs. All types of vintage compacts featuring everything from the Florida Everglades to Mount Rushmore can be found today, and these aren’t terribly expensive in most instances. Even plainer versions of compacts made by well-known companies like Elgin-American and Volupte can be located at bargain prices. These can be a little worse for wear sometimes since the "everyday" compacts like these got more purse use than some of the fancier models. Sweetheart compacts, akin to sweetheart jewelry, are also popular crossover collectibles since they feature patriotic themes generally related to World War II. These can often be found in the $25 to $50 range, and some of them are quite interesting additions to a varied compact collection. Compact prices have leveled out over the past 10 years or so. Collectors nabbing these little beauties 15 or 20 years ago gasp when they see that even the most common examples sell for $20 and up today when in excellent condition, but prices aren't rising rapidly in value as they once were. Rarer examples mentioned above can sell for hundreds when found complete and in excellent condition, but it may take some time to sell them for top prices in today's marketplace. Even with some compacts garnering formidable prices, a nice collection can still be accumulated without breaking the bank. If you're seeking them more as curiosity pieces representing a nostalgic era rather than finding all the rarest examples, you'll do pretty well amassing an interesting collection with only moderate cash output.